Chor der Bayerischen Staatsoper, Bayerisches Staatsorchester / Zubin Mehta. Stage director – Johannes Erath. Bayerische Staatsoper, Nationaltheater, Munich, Germany. Monday, March 28th, 2016. 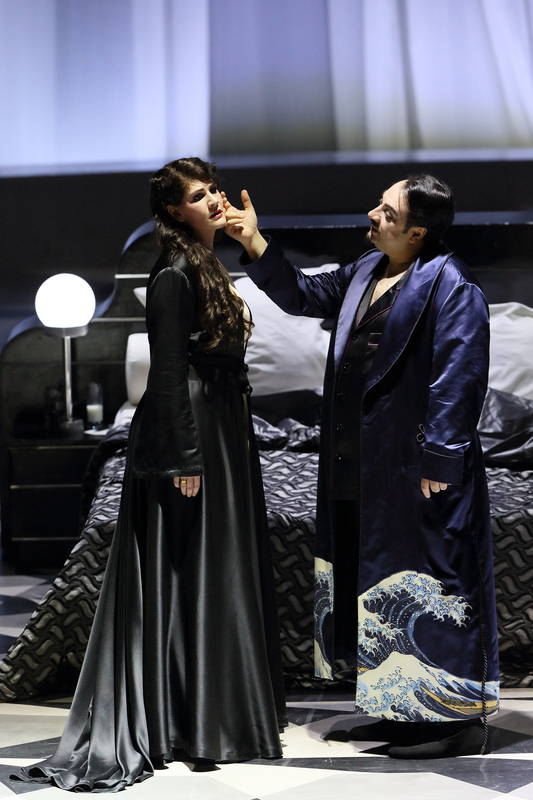 In Act 2 of Un ballo in maschera Amelia sings to Riccardo ‘Ahi sul funereo letto ov’io sognava spegnerlo gigante torna in petto’. 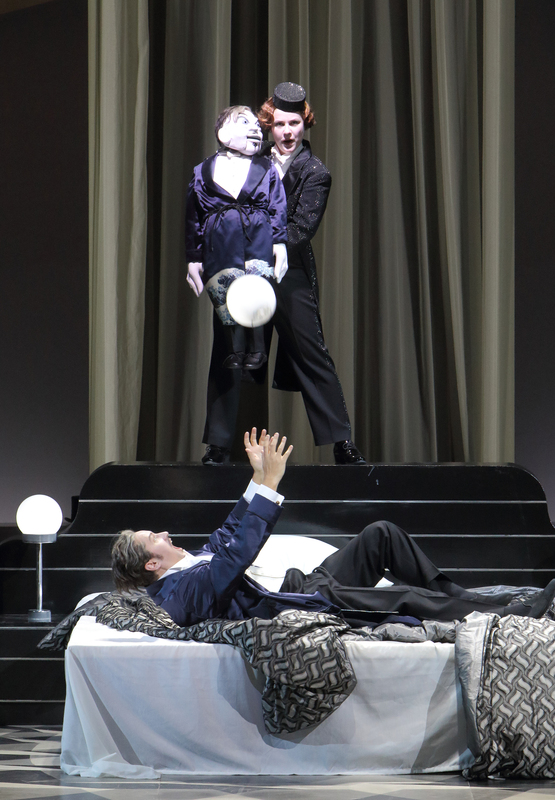 The ‘funereo letto’ is a constant presence in Johannes Erath’s staging seen hovering above the stage with an immobile male figure lying on it. Clearly, Riccardo’s fate had been foreseen from the very beginning. Ulrica is also a constant presence on stage, seen as the curtain opens and at the end, it is she who is in control of the destiny of the characters. This Ulrica is less of the fanatical seer that we normally get than a subtle, thoughtful figure whose presence is the cause of the events that we witness. 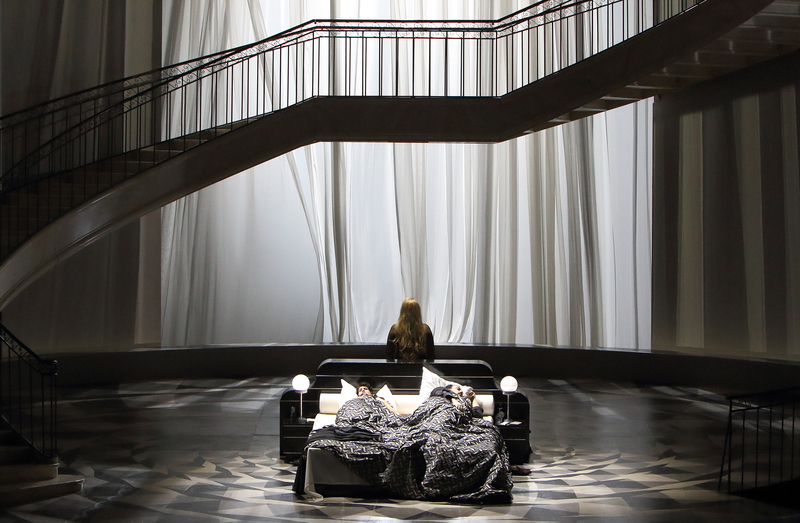 A single set (Heike Scheele) with another funereal bed as its centrepiece is the framework for the action looking like a 1930s grand hotel with costumes (Gesine Völlm) also redolent of that period. 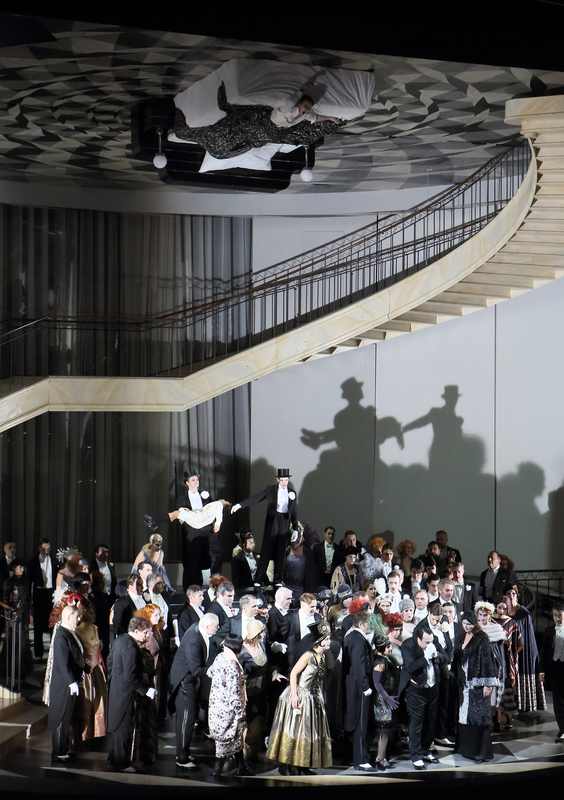 Occasionally characters, particularly Oscar and the chorus, will indulge in vaudeville-like dance routines that sit appropriately with some of Verdi’s more up-tempo moments, Erath seemingly aiming to bring out the ‘tragedia mutò in commedia’. Anna Pirozzi was a very late replacement for the scheduled Anja Harteros who was suffering from a cold. Naturally Pirozzi had had very little rehearsal but we were informed that she had worked intensively with the maestro over the past 24 hours. I imagine it must have been quite a daunting assignment and she may well have been extremely nervous which might explain why the voice didn’t quite soar in her opening phrases. Surprisingly for a native Italian speaker I found Pirozzi made very little of the words, that ability to marry text and notes not really in evidence. She also at first undershot at the top and tuning was an issue throughout the evening. Despite that, as she warmed up, the voice opened up and she phrased some of the soft, sustained writing well. The voice has a distinctive tang with a pleasant fast vibrato. She sang ‘morrò, ma prima in grazia’ with genuine feeling and dignity. Piotr Beczała was an extremely satisfying Riccardo. His legato is absolutely glorious and his aristocratic line was an ideal match for his character. His singing felt genuinely Italianate and he really managed to marry text and music in a wonderful way. Nevertheless, it felt that he was pushing the voice, trying to make it sound much bigger than it is. The voice is a good size and doesn’t need to be pushed and the downside was that as the evening progressed the very top became tighter to the extent that I started to fear he wouldn’t last the course. There was undoubtedly something deeply satisfying in Beczała’s singing; the beauty of the legato and his magnificent phrasing really are things to treasure. George Petean was a much more introspective Renato than we often hear and there was much to be said for this approach. His ‘eri tu’ was genuinely sung with real feeling rather than barked out as it so often is. He has a decent legato, a few aspirates in the line notwithstanding, and if the top discolours slightly, his undisputable musicality made his a very effective portrayal. Sofia Fomina was a very feminine Oscar sung with a crystalline tone and a genuine trill. 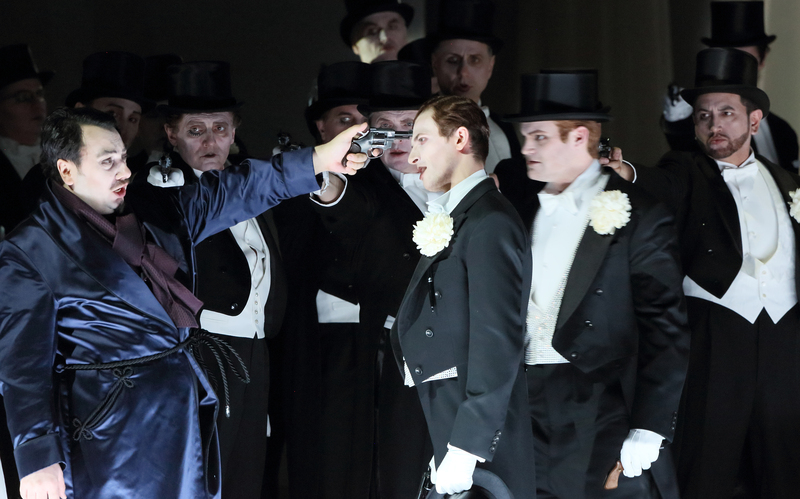 The roles of Samuel and Tom were very well taken by Anatoli Sivko and Scott Conner, both exhibiting warm and rounded voices with genuine distinctiveness. Two singers I would definitely like to hear more of. I found Okka von der Damerau’s Ulrica somewhat problematic and this I felt was due to the production rather than her singing in so much as she needed to portray a softer, more mystical figure than the commanding fanatic it seems the music calls for. Her singing was rich but somewhat soft-grained and I longed for her to really let rip with the chest. It was certainly very musically sung and a different way of seeing the character if not perhaps one I was completely won over by. The remainder of the roles were sung with the very high standards that one expects of this, one of the world’s greatest lyric theatres. 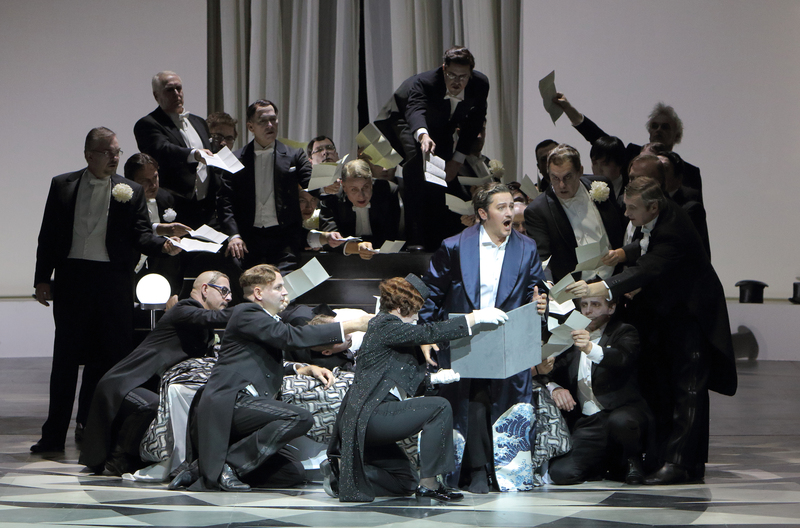 The chorus sang extremely well, with ensemble spot-on but Erath’s decision to place the chorus off-stage in the scene with Ulrica was a misfire as they were barely audible. Mehta gained string tone of remarkable depth from the house orchestra but very occasionally tuning in the strings had a tendency to go sour. I found Mehta’s tempi a little too weighty for the piece. While he certainly stirred up some real passion in the scene at the ‘orrido campo’ it also felt that the music lacked the rhythmic impetus and precision that it really needed and, as I mentioned at the top, at times it jarred with the stage pictures. This was a somewhat mixed evening. The staging was based in a reading of the text that really should have worked very well but ultimately felt to me that it didn’t, simply because Erath tried too hard to add extraneous layers onto the narrative rather than letting it speak for itself. The singing was never less than good and in some cases much more than that. It was certainly worth seeing and Beczała and Petean in particular gave a great deal of pleasure.